The Presto 10GbE SFP+ dual-port 10 Gigabit Ethernet PCI Express 2.0 adapter card enables you to connect your computer to high-speed infrastructure and storage without stepping down in speed. Setup is simple—after installing the low-profile card into an available x8 or x16 PCIe slot in your computer, just download and install a driver, connect to the switch or device’s 10GbE port via LC optical cables (SFP+ optical transceivers and optical cables sold separately), CAT-6 or CAT-6A copper cables (RJ45 SFP+ copper transceivers and cables sold separately), or direct attach Twinax copper cables (sold separately), and then configure the card through the OS X® Network control panel or Windows Device Manager. This Sonnet solution is perfect for high-performance computing where low latency, high bandwidth, and low CPU overhead are required. Its increased throughput performance and low host-CPU utilization are achieved through functions such as support for flow control, 64-bit address support for systems using more than 4GB of physical memory; and stateless offloads such as TCP, UDP and IPv4 checksum off2loading, enabling your computer to perform better while large files transfers or high I/O operations take place. 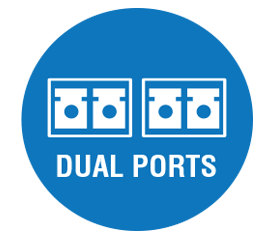 With its dual ports, this Sonnet adapter supports transparent failover to keep your computer connected in case a single cable is disconnected or one of the ports fails, and it also supports link aggregation (teaming)(2) for increased throughput! Got a Thunderbolt connection, but no PCIe slot? Presto 10GbE SFP+ is ideal for use in one of Sonnet’s Echo Express or xMac Thunderbolt-to-PCIe card expansion systems—the combo enables you to add ultra-fast 10GbE network connections to any Mac® or Windows PC with a Thunderbolt 2 port. 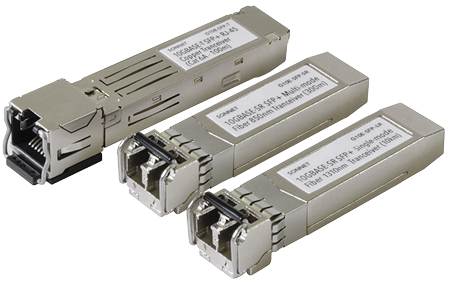 Connection requires SFP+ optical transceiver modules (with LC optical cables; sold separately), RJ45 SFP+ copper transceiver modules (with CAT-6 or CAT-6A cables; sold separately), or SFP+-terminated “Direct Attach” twinax copper cable (sold separately).